Granville Island is the home of the Feathercraft factory. It is also the site of the world famous Public Market, two theatre venues, a plethora of artisan shops, the Emily Carr School of Design, the Granville Island Brewery, a kids water park, a cement factory and the Granville Island Hotel. Any visit to the city of Vancouver should include a trip to this unique district. Feathercaft is one of the oldest operating companies on Granville Island. When the area was developed for commercial use in the late 1970s, Feathercraft was operating out of a small yellow shack, to narrow for a double boat to spin. 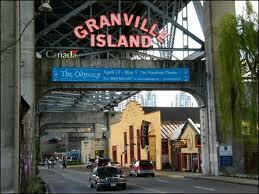 In 1985, operations moved to the current location, on the eastern corner, near the Granville Island Hotel. The factory now has the capacity to produce a full line of handmade kayaks that are shipped and sold all around the world. Interested in visiting? Stop by between business hours and we will be more than happy to give you a tour. If you have trouble finding our location, call us for directions. You can arrive by Aquabus, ride the seawall, take a public bus or park your vehicle within a one-minute walk. If you're in Vancouver, it's worth your time to visit the home of one of Canada's most unique exports.